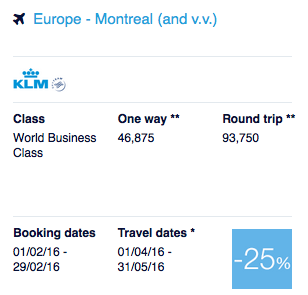 The newest set of Air France KLM's Promo Awards were released today but won't be bookable until February 1st (well 6pm EST on the 31st) The discount ranges from 25 to 50% off the regular amount of miles required. 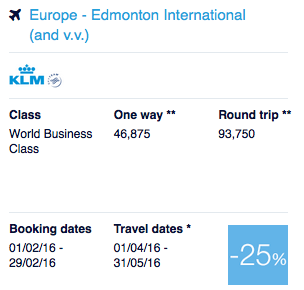 As you can see just by the discount this can be a very good offer if you get 50% off for Business Class! However this month's bookings are all at 25%, still decent if your planning to redeem anyways. Three Canadian cities are up for a discount in this latest offering. 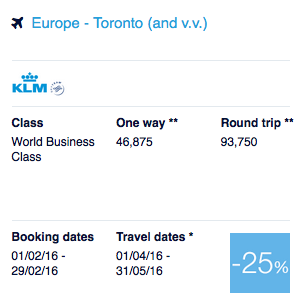 Edmonton, Montreal and Toronto are all available at 25% off for business class redemptions on KLM.